Louis Koo (古天樂), Sean Lau (劉青雲), and Angelica Lee (李心潔) attended a charity premiere of their new film Inferno 3D <逃出生天3D> on September 23. Previously, some reports claimed that Louis has a financial stake in the film. Louis denied making any investment and made no comments when asked if he is interested in making movies. When asked if anyone has approached him about movie investments, Louis said, “Nope! I enjoy being an actor. Investing in films is very risky. I would only consider it if I can make a guaranteed profit.” He added that if he does make a film, he would definitely ask Sean to star in it. Sean agrees with Louis’s sentiments, saying that he prefers to remain an actor instead of becoming an investor. While the two male leads chose to arrive in complementary outfits, Angelica Lee opted for a more attention-grabbing red dress. Married to husband and Inferno director Oxide Pang (彭順) since 2010, Angelica remains childless except for a step-daughter from her husband’s previous marriage. Since she was wearing a loose gown, some reporters asked Angelica if she is expecting. Angelica denied the pregnancy speculation, and when asked if she has plans to have children, said, “I would love to, but I don’t want to give myself too much pressure so we will let nature take its course.” Asked if her husband has given her any pressure about having children, Angelica replied, “He didn’t. He has a daughter with his ex-wife. I probably want kids more than he does. I would like to experience motherhood.” She added that she has been pursuing a healthy lifestyle, going out for runs and practicing tai-chi, in order to increase her chances of conceiving a child. 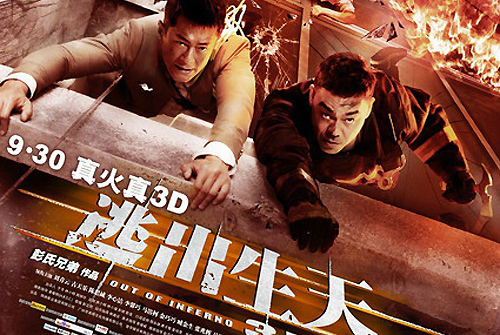 The trailer of “Inferno 3D” resembles a Hollywood action film. Along with “Unbeatable”, this looks to be one of Hong Kong’s more exciting recent releases. Poster looks good but not sure about the 3D part. I always thought Angelica Lee was pregnant when she married. So she wasn’t. Would love to see this in 3d in a theater, but I doubt it will be released like that in the states – if at all. I can’t wait to see it though! no 3d where I at.